So, you want to start a blogging website? Well, then you have come to the right place. We will give you an in-depth tutorial on how to start your very own blog and begin making money online. Just follow along with this easy step by step guide and get started blogging in no time! My name is Reginald Dierckx and I have been blogging for about ten years now, mostly in Dutch. This is my first blog in English, but the basics of blogging are the same in any language. Every blog I ever started, I created from scratch and over the years I have perfected my own system of writing engaging content, promoting my blog posts and earning money while doing so. I am also an affiliate marketer and I own and maintain more than twenty affiliate websites. You can check out some of my links here. This course is aimed at beginning bloggers and doesn’t require you to have any prior knowledge about blogging. You don’t have to know any HTML or coding. You don’t even have to be an outstanding writer. All you need is enthusiasm and a desire to make it online. You will learn the art of blogging as you go along. The goal of this course is to get you started in the simplest way possible and to get you started THE RIGHT WAY and RIGHT NOW! Not tomorrow or next week, no, the aim here is to get you started blogging TODAY. All you have to do to get you started blogging today is read this course. This is also known as finding your niche. Your niche is the subject you are going to write about and the target audience you have in mind for doing so. This will greatly differ from blogger to blogger, so we are not going to go into too much detail here. Do I have any hobbies I could write about? What kind of magazines do I enjoy reading? Do I have knowledge about a specific topic? Having a certain amount of knowledge about a topic beforehand can come in handy, but it isn’t necessary! You can do your research online and become an expert in your subject as you go along. What is important is that you want to invest the necessary time to learn more about a topic. Are there any opportunities for selling products in my niche? Check out Amazon.com and see if there are any product you could start selling online with your blog posts. The bigger the number of products you can find and the more popular they are on Amazon, the bigger your potential income as a future affiliate marketer will be. Don’t forget that affiliate marketing will most likely be your biggest form of income. But Amazon.com isn’t the only possible source of affiliate revenue, so do some online research and you will find other affiliate opportunities. One of the important choices to make when starting your very first blog is which blogging platform to use as a content management system or CMS. In all honesty, it isn’t that difficult a choice to make. WordPress stands out among its competitors as the de facto standard blogging platform in the world. WordPress is a very stable CMS that is used by millions of blogs in the world. Almost 33% of all websites and more than 50% of all blogs use WordPress to drive their site. To be honest, there are some other high quality blogging platforms out there, but for beginners there is no better choice than WordPress. This website, for instance, was built with it in just a couple of minutes. Without the content, of course. Also, you shouldn’t create your blog on a free blogging platform like the free hosted version at wordpress.com or blogger.com. You really shouldn’t. There are a lot of advantages to self-hosting your blog. And, it’s the only professional way to go. Eventually you will want to move your blog to a self-hosted solution and you’ll encounter a whole bunch of unnecessary problems. Google will have to reindex your content and it will be like starting over all over again. Save yourself this pain and start with a self-hosted solution like DreamHost from the start. It is far less costly than you might think. You can get started with your blog for less than $4 per month, domain name included! Now for the more technical, but fun part: getting your domain name and hosting. What is a domain name? It is the address of your blog in the form of YourBlogName.com. What is web hosting? It is the online space on a web server your blog is located in. You rent this space for an annual fee with a hosting provider. Prices can vary greatly from hosting provider to hosting provider, but we will give you some pointers there as well to get you going as cheaply as possible. Getting your domain name is easy, it comes with the hosting. But what domain name should you get and with what extension? If you are lucky you already have a name for your blog in mind and it is just a matter of converting it into a url. But often novice bloggers have no idea what domain name to pick. The important thing here is that your domain name is easy to remember and spell for your visitors and that it cannot be confused with another domain name in your niche. There are a lot of hosting providers out there and over the years I have tried out many of them. 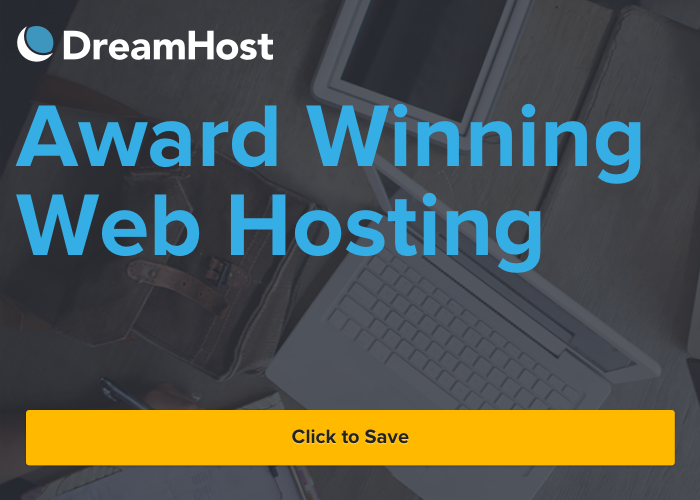 When comparing hosting providers with those four key features in mind, there is one that stands out and that is DreamHost! DreamHost is recommended by WordPress.org and provides excellent quality for the very low price of $2.59/mo for their Starter package! They also offer a very easy one-click installation of WordPress so you yourself don’t have to worry about any technical details. So what are you waiting for? Visit DreamHost and get started with your very first blog. After setting up your hosting account, you can come back here and finish the course. If you want to know how you can set up your hosting at DreamHost and install WordPress click here for a step by step guide. If for any reason you don’t want to use DreamHost we recommend SiteGround as a viable alternative. It is a bit more costly, but they offer an even wider range of services for the professional WordPress blogger. Now that you are all set up and ready to go it is time to start blogging. In the next sections I will help you get started with WordPress and I will give you extra blogging tips. The first thing you will want to do is to choose a theme for your blog. Don’t worry if you are having difficulty finding the right theme from the get go. You can always change your theme later on once you are more comfortable blogging and using WordPress. But picking a theme is a great way to start your blog and to get to know the interface of WordPress. To pick or change a theme you can click on Appearance > Themes in the left menu. This will give you an overview of all the themes you have installed on your WordPress blog. Click on ‘Add New’ on the top of the page to add a new theme. Now click on ‘Popular’ to see what themes are most popular in the WordPress community. If you hover over a theme you can install it with one click of the button. Click on ‘Activate’ to make the theme live or click on ‘Live Preview’ to see what the theme will look like on your blog, content included, without actually installing it. Take your time to browse some of the popular themes and don’t be afraid to install several of them. In the example below you can see how I am able to change the colors and fonts of the text of my chosen theme Vogue. In my installation of Vogue I have completely changed the default look by choosing my own fonts and colors and by getting rid of the slider on the homepage. Take your time to experiment with your theme settings, but don’t forget to come back to this section once you have some content on your blog like pages, blog posts and widgets. It’s much easier to judge how your theme looks in reality that way. First, it’s a good idea to add some static pages. An About page is a good place to start. You can edit an existing example page or create a brand new page by going to Pages > Add New. After this step you will see the editor of WordPress. Fill in a Title for your page and start adding your content. Take your time to explore some of the options of the editor and hover over the buttons in the menu to see what each of them does. Also check out some of the other options you have in the other windows on the page. Add an image to your text and set a featured image. After you are done, click Publish. If you want to add your page to one of the menus your theme provides, you can go to Appearance > Menus and add it there. First select the menu you want to edit and afterwards add or remove items from that menu. You can add pages, posts, blog categories or even custom links to each menu your theme offers. After you have created your first page go to Posts > Add New and add a blog post in the same way. Extra options here include setting categories and tags for your blog post. Widgets are custom blocks of content that are usually but not always displayed in the sidebar of your pages. Go to Appearance > Widgets and check out which widgets are active and if you need to change them. Change the title and tagline of your site. Set the timezone. Change or set your default email address. Set your homepage to a static page or a page with your latest blog posts. If you choose a static homepage don’t forget to set another page to hold your latest blog posts. You can add that blog page to a menu later on. Choose some settings for your comments. Don’t forget to activate the Akismet plug-in that is included in your blog to block spam comments. The plug-in has a free version on activating when you use the slider on the payment page and set it to zero. A very important setting here is the default url structure for your blog posts. Most blogs will choose the ‘Post name’ setting. This setting is best for SEO purposes and for Google. Plug-ins offer a great way to extend the functionality of your WordPress blog. When you start using your blog you will begin to notice that you want to have more options than the default installation of WordPress provides. Click on Plugins in the left sidebar to see what plug-ins are installed and to install new ones. Click on ‘Add New’ to browse Featured, Popular or Recommended plug-ins. If you know the name of the plug-in you want, you can go ahead and search for it. After finding your plug-in you have to install and activate it. Don’t forget to go to the settings page of the plug-in to configure it. Akismet comes preinstalled with WordPress and is a plug-in that blocks spam comments. When activating it you can choose to use a free version of the plugin. All in One SEO is a plug-in that allows you to optimize your blog for Google. Just activating it ensures your WordPress blog has better SEO settings than the default installation provides. Another SEO plug-in that is very popular is Yoast SEO. Classic Editor ensures you can keep using the classic, easy to use WordPress editor instead of the new Gutenberg editor that ships with WordPress 5.0 and which is heavily criticized. Jetpack enables you to have the same features as WordPress.com installations. Among other things it allows you to have nice sharing buttons for your pages and posts. WPForms Lite lets you easily add a contact form to your WordPress blog. This concludes our beginners’ guide to WordPress. Now it’s time for some more tips on how to start blogging. Post as many new messages as you possibly can without losing quality. Fresh content ensures your visitor come back to your site. Google likes new content as well. If you want to score in the search engine result pages you have to blog often. Don’t spend too much time polishing and rewriting your posts, but publish them. Ask for comments from your visitors and use their feedback to make your blog even better. Comments will make you understand why your visitors come to your site and they might give you new ideas for subjects to write about. Set up a Google Adsense account if you want to make money with ads. Starting a blog is not always easy and a novice blogger often has a lot of questions and concerns in his mind. To answer some of those questions, we have started a small Q & A here at Start a Blogging Website. If you have any questions that you would like to receive an answer to, make sure to leave a comment. I will respond as soon as possible. If the question is interesting for a wider audience, we will add it to these questions and answers. Question: should I start a blog for my company? A blog allows you to communicate more directly with your potential customers. It can ensure that your website scores better in Google and is therefore easier to find for people looking for your type of business. It also ensures that your company comes over less formal. Please note: only start a blog if you have enough room within your organization to regularly post new and interesting messages, otherwise you should not start it. Question: I have no technical skills. Can I start a blog? Of course! The most important condition for starting a blog is that you have something interesting to tell your audience. There are plenty of possibilities where a blogger without technical knowledge can start, just think of Blogger.com or WordPress.org, where you can start immediately. If you really want to start blogging professionally, it is better to look beyond these two platforms and install WordPress on your own domain with your own hosting. We recommend DreamHost as a hosting provider. DreamHost allows to easily install WordPress with one click. Question: How long does it take before I start earning money with my blog? That depends, but keep in mind that it can take a while for you to see some serious earnings. This can easily take a year, so it is important to keep blogging even if you have little success at the beginning. Much also depends on whether you can attract a lot of visitors in a short time. If you can start with affiliate marketing on your blog like the affiliate program from Amazon, you can sometimes generate quite a bit of income. To make money with Google ads (Adsense) you have to have quite a few visitors. Question: do I need design skills myself to be able to create a nice looking blog? No, that is not necessary. With WordPress you have access to a huge number of themes that will make your blog look beautiful without you having to do anything or pay for it. If you want your blog to stand out among others and offer more possibilities, you can consider paying for a theme, but that does not have to be expensive. Question: do I have to manually register my new blog with Google? No, you don’t have to do that anymore. A better option is to create an account at Google Search Console. This makes Google aware of the existence of your new blog. After that you can use all the possibilities that Search Console offers to monitor the performance of your blog. A real must for the professional blogger! Question: I already have a website for my company. Do I have to place my blog on that website or on a separate domain name? This is a difficult question. Each of the options has advantages and disadvantages, it depends on what is most important to you. If the content of your blog is closely related to your existing website and you want the visitors on your blog to take action on that website, like a purchase, then it is best to place the blog on your existing website. If your main goal is to attract more visitors, it may be better to place the blog on a separate domain. Question: What is the best way to make money with my blog? There are several ways to make money with your blog such as affiliate marketing, Google ads and native ads. But many professional bloggers will tell you that the best way to make money with blogging is to sell your own products. With affiliate marketing, such as the Amazon affiliate program, you get a percentage of every sale that happens through your website. In other words, you are dependent on your affiliate partner. With advertisements you mainly earn money when someone clicks on an advertisement, but your visitor leaves your website when he or she clicks on an ad. If you really want to earn serious money with your blog, you have to focus on developing your own products and selling them. But that is not always easy. One of the best options is selling e-books or online courses. For Startabloggingwebsite.com this could mean for example writing an extensive e-book with all the ins and outs of starting a successful blog. When people read our articles with the basic information there would be a call to buy our e-book at the bottom of our posts. For the time being we have no plans for this, but it is an example of what is possible. At the start of your blog it is best to focus on affiliate marketing and starting your own newsletter as ways to make money. If you start seeing enough visitors, you can add advertisements. The further you get with your blog, the better you will have an idea if selling your own products is a possibility. Question: How can I quickly start a blog? You can quickly start a blog at Blogger.com or WordPress.org for free. But a better way to do it is to pay for web space at a hosting company that allows you to choose your own domain name and install WordPress on it, often with a simple click. An example of good hosting provider that allows this is DreamHost. Prices at start at $2.59 a month. Question: how much does a domain name cost and how do I get it? You usually get domain names through your hosting company. Your own domain name, with no hosting, will cost you anywhere from $12 to $25 a year. At DreamHost a domain name costs about $12 a year, hosting will cost you $2.59 a month. Question: why do I have to have my own domain name? Your own domain name is valuable. It is your own brand and business card on the net. Your own domain name will be easier to remember than the long URL that you can get with free blogs and it will generate more visitors. Question: what is the best blogging platform? Blogger.com and WordPress.org are among the best and most well-known blog platforms in the world. WordPress is used on no less than 33% of all websites in the world so it is a very stable platform and probably the best choice for your website or blog. It can be adapted to your needs and taste in an infinite number of ways. Question: what should I talk about in my blog? You can decide that yourself. It is important that your subjects revolve around a central theme and that they are relevant and meaningful for your target audience. Google also wants your content to be relevant and websites that focus on a central theme will score higher in the search results. If you offer a service or product, it is also important that the topics of your blog are in line with this. You can place a link at the bottom of your blog posts where you advertise your service or product. Question: do I have to post messages regularly? Definitely. A good basic rule is that you post a new article on your blog 3 times a week. This is also a good idea from an SEO point of view. If you have a lot to say about a certain topic, you can spread that over several blog posts. Question: How long should my blog post be on average? The length of a blog post is usually measured in the number of words it contains. In WordPress you can easily take a note of that length at the bottom of the WordPress editor. A short blog post can be about 500 words. We speak of a long post if it contains about 2000 to 3000 words. An average that works well for Google is about 1500 words. In practice it depends very much on your writing style and the depth of your articles. In the end, it’s about what works for you so you can experiment with messages of different lengths when you start. But the answer to the question is 1500 words. Question: I just wrote a new blog post. How can I ensure that it appears immediately in Googles search results? You can do this through Google Search Console. Log into your Google Search Console account and use the URL inspection functionality to ask Google to index your page. Question: Can I start a blog if I am not a good writer? That is quite possible. Your qualities as a writer will improve over time. So just start! Outsourcing is another option if you really want a blog for your website but don’t want to write it yourself. Important for a blog is to write like you would talk and in an informal way. Question: my blog is online with several articles, but I don’t get any visitors. What should I do? There are several ways you can get targeted traffic to your blog. Using SEO (search engine optimization) is one way and it is the best way. This technique brings you organic traffic by adding high-quality content to your blog and works in the long term. An important point with SEO is to use the right keywords in your text and titles. There are several plugins that help you to optimize the SEO of your WordPress site. We recommend the All in One SEO plugin. The standard installation of WordPress is not really good for SEO, because of many pages with the same content, but more about that later. Another way to attract visitors is through paid traffic, but that costs money of course. Question: How can I measure the success of my blog? One of the most widely used tools to measure the visitor numbers of your site is Google Analytics. You can create an account at Google Analytics and enter the necessary code in your WordPress site through a plug-in like All in One SEO. Google Analytics allows you to see where your traffic comes from and which blog posts have the most readers. All this data allows you to come up with ways to attract even more visitors. Question: How can I integrate my blog with my social media accounts? That’s easy. You can easily integrate your blog with your social media such as Facebook, Twitter, Instagram & Pinterest (for images), Google+ and LinkedIn by sharing your blog posts there and allowing followers on your social media channels to click through to your blog. It is also easy to put buttons on your own blog posts, so your visitors can share and like your blog posts on their own Twitter and Facebook accounts. The Jetpack plugin allows for easy sharing of your blog posts. Question: How do I find new topics for my blog posts? A good first place to look at is the comments you get on your blog and on your social media. If a comment is a question, it can be a subject for a subsequent blog post. But there are other ways. For example, you could take a look at our list of 100 ideas for topics for your blog. Question: How can I best promote my blog once it’s online? In any way possible. It is important that you get a link to your website on as many other websites and blogs as possible. Do not forget to put a link on other websites that you already own, if possible on the home page. In addition, you must of course use your existing social media accounts to promote your blog. If you already have some experience as a blogger you can check if there is a possibility to write a guest blog on another blog, preferably one that is active in the same niche as yours. Other ways of promoting your blog are YouTube for videos and Instagram and Pinterest for images. If you are already sending out email newsletters, you should also link to your latest blog posts in those. Question: Where can I find free images that I can use on my blog? We have made a list with websites where you can find free high quality photos. There is no better time to start your blog than right now! Set up your hosting plan at SiteGround and start blogging today. Be sure to send me an email when you have launched your new blog so that I can check it out myself. Start a Blogging Website wants to provide beginning bloggers with all the information they need to start their very first blog. We do this by giving new bloggers in-depth tutorials and guides about starting your blog, writing engaging content, promoting your blog posts and making money while doing so. My name is Reginald Dierckx and I have been blogging for about ten years now. I really enjoy teaching other people how to start their own blog. Over the years I have perfected my own system of creating engaging content, promoting that content and earning throught online ads, affiliate marketing and selling my own digital products.